It is not necessary that the thousands of metric tons of carbon dioxide (CO2) emitted every year from power plants have to reach only the atmosphere. Scientists hope that by the next decade, CO2 waste could be affordably captured and transformed into useful molecules for renewable fuels, pharmaceuticals, biofuels, or feedstock. A team of US and Canadian researchers have described their proposal for making better use of CO2 and the ways to achieve it, in the Joule journal on March 29, 2018. Similar to how a plant takes carbon dioxide, sunlight, and water to make sugars for itself, we are interested in using technology to take energy from the sun or other renewable sources to convert CO2 into small building block molecules which can then be upgraded using traditional means of chemistry for commercial use. We’re taking inspiration from nature and doing it faster and more efficiently. De Luna is the first author of the study along with postdoctoral fellow Oleksandr Bushuyev. Both of them are members of the Edward Sargent Lab at the University of Toronto. Sargent, who is the senior author of the study, is a professor in the Department of Electrical and Computer Engineering. Their investigations revealed a range of prospective small molecules that make economic sense and could be produced by transforming captured CO2. For energy storage requirements, ethane, methane, and hydrogen could be used in biofuels. Moreover, ethanol and ethylene could function as the building blocks for a wide array of consumer goods, and CO2-extracted formic acid could be used in fuel cells as a fuel or in the pharmaceutical industry. 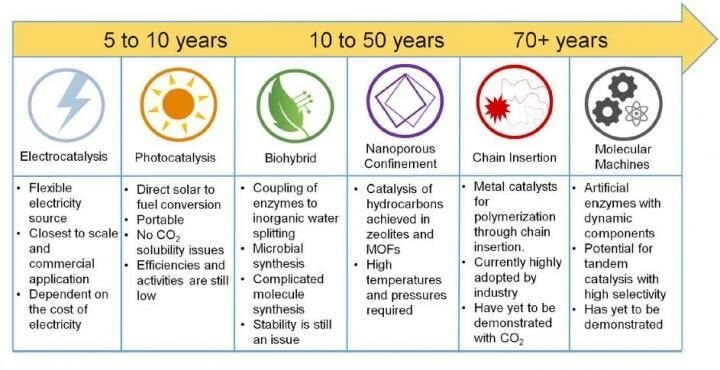 Although prevalent technologies for capturing CO2 waste are in the developmental stage, the scientists believe that there will be a significant improvement in realizing the capture and transformation of CO2 in the coming decades, since new start-ups are currently working to develop techniques for commercial application. By the next 5 or 10 years, electrocatalysis - which involves stimulating chemical reactions using electricity - could be employed to achieve this process. Furthermore, within the next five decades, nanotechnology or molecular machines could drive the transformation. This is still technology for the future, but it’s theoretically possible and feasible, and we’re excited about its scale-up and implementation. If we continue to work at this, it’s a matter of time before we have power plants where CO2 is emitted, captured, and converted. The researchers have complete knowledge of the drawbacks of carbon capture and transformation. First, it has been deemed to be economically not feasible, specifically due to the cost of electricity needed to initiate these chemical reactions. However, this will possibly be reduced when renewable energy becomes largely available over time. Second, only a few factories that have a high carbon footprint emit pure CO2, needed for conversion; however, technology that could assist in overcoming this problem is in its developmental stage. The motivation to write this piece is that we wanted clear insight into whether this could be economically viable, and whether it’s worth the time to invest in it. This paper images a pathway for what we can do with carbon dioxide conversion in the coming decades. Various insights for the investigation were developed in cooperation with Ling Tao, Genevieve Saur, and Jao van de Lagemaat from the US National Renewable Energy Laboratory. The Ontario Research Fund: Research Excellence Program, the Natural Sciences and Engineering Research Council of Canada, and the CIFAR Bio-Inspired Solar Energy program financially supported this study.